Many years ago I was introduced to the Pig Pickin' Cake. It’s the perfect cake to serve on a warm summer evening. 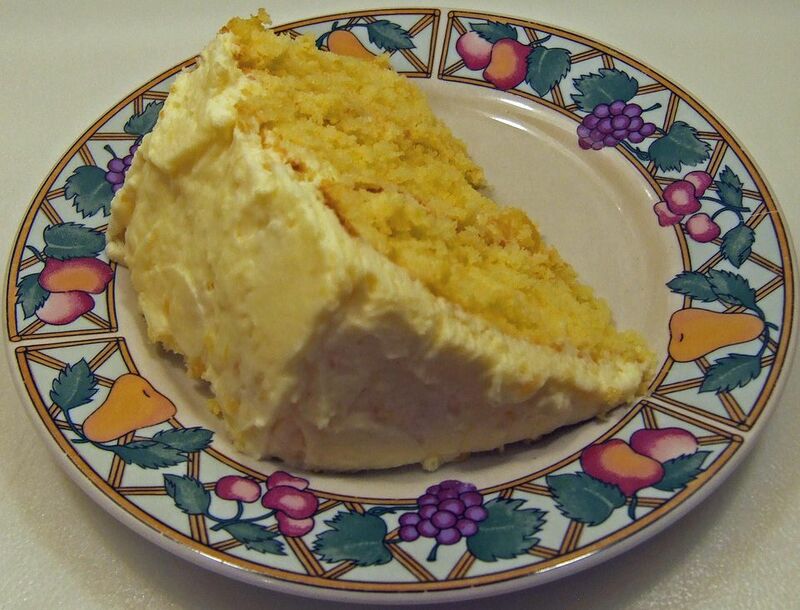 It is a very creamy cake made with lots of mandarin oranges and a cake mix. Many people are avoiding cake mixes these days so I came up with this from-scratch version. I still haven’t come up with a way to not use the pudding mix and still have it taste as good. Preheat the oven to 350 degrees F. Grease and flour two 8-inch round cake pans. In a small bowl, whisk the flour and baking powder. Set it aside. Cream the butter and the 2 cups of sugar. Add the eggs one at a time until all is combined. Add the entire can of mandarin oranges. Beat it into batter, slightly crushing up the oranges. Slowly add flour the mixture until well mixed. Divide the batter between 2 pans. Bake the cake for 25 to 30 minutes. Cool in the pans for 2 minutes. Remove them from pans and completely cool then on a wire rack. Place one cake layer on a serving plate. Ice with 1/3 of the frosting. Place the second layer on top. Ice the top of cake with 1/2 of remaining frosting. Ice the sides of the cake with the final amount of frosting. Refrigerate your cake for at least one hour prior to serving. Store the leftover cake, if there is any, in refrigerator. Whip the cream with remaining 1/2 cup of sugar and pudding mix until stiff peaks form. Hand stir-in pineapple and juice. To make sure you get a really white cake, use clear vanilla extract and only egg whites. Frost it with a thick and creamy vanilla frosting. There are cream and nuts in between each layer. It can make a pretty statement too. This is the cake you'll make over and over again. I don't know which is better the cake or the frosting. I like this cake because it's cold and can be made with any flavor. Chocolate, chocolate and even more chocolate is what makes this cake so good.